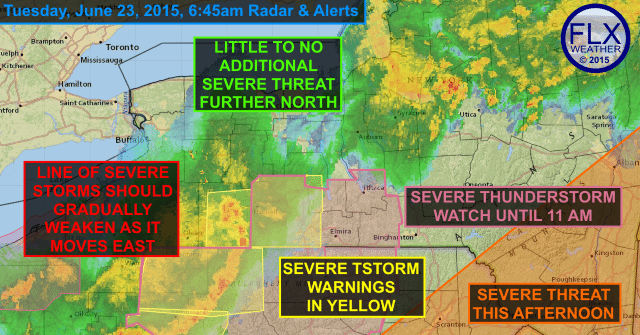 A line of severe thunderstorms is skirting along the Southern Tier this morning after a previous line brought some wind damage to parts of the northern Finger Lakes. 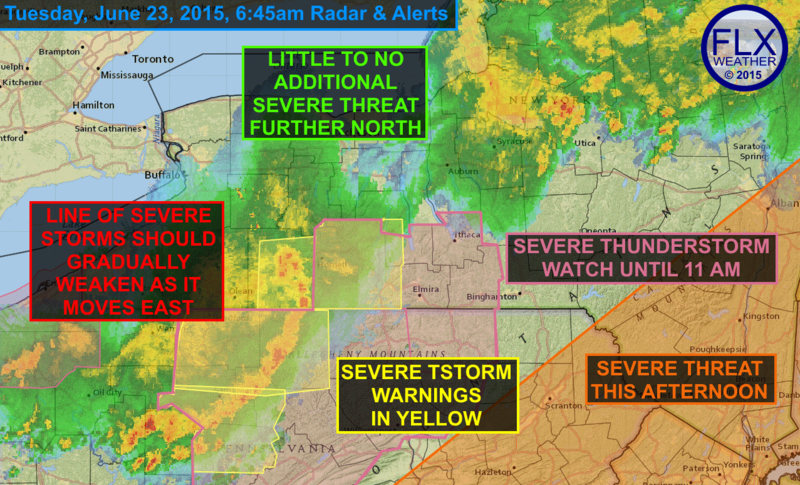 The thunderstorms, and severe threat, will quickly move east this morning. A couple of early morning lines of strong to severe thunderstorms have moved through our region. As these storms push east, little else is expected in the Finger Lakes today. 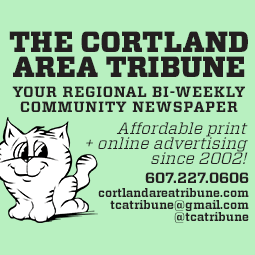 At 6:45am, a line of severe thunderstorms was moving across northern Pennsylvania and the Southern Tier counties of New York. Out ahead of this line, a severe thunderstorm watch is in effect for Steuben, Chemung, Schuyler, Tompkins and Tioga counties until 11am. Damaging winds are the primary threat with these storms. As this line moves east this morning, it should begin to weaken and dissipate, which is why the watch was not issued any further east. Some locally strong winds and heavy rain are possible with this line as it pushes east. Earlier this morning, a similar line moved from Buffalo to Canadaigua before it rapidly weakened. Locally heavy rain from this cluster of storms is moving into the Adirondacks and Mohawk Valley. For the most part, this will be the extent of our action today. A few more thunderstorms may develop early this afternoon as the cold front moves through, especially across the eastern parts of the Finger Lakes. However, these will probably push well east of the area before they can organize into severe storms. The greatest severe threat today should be well to our east across New England, eastern Pennsylvania and into the Mid Atlantic states. By this evening, cooler air will start to work in behind the front. Wednesday will turn out fairly similar to Monday, but a bit cooler with highs in the low to mid 70s. A few showers may return to the area Thursday and/or Friday, but the weekend is still looking dry.